Hopefully you weren't disappointed (or even worried) that there wasn't a blog entry last night, I assume it was obvious that I was busy elsewhere, watching Laphroaig Live 2012 from Germany. Admittedly my choice for this week's Friday Islay picture is a bit obvious, but could I really pick anything different tonight? 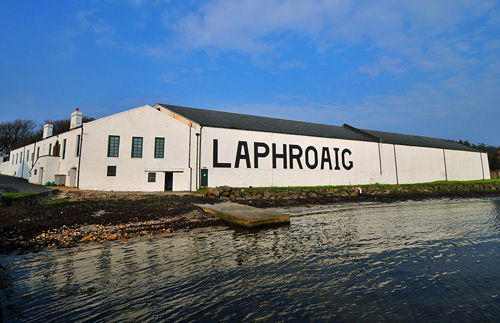 This is of course at Laphroaig, the offices and some of the warehouses. The picture is from April 2011, I walked out to the end of the concrete wall stretching into Loch Laphroaig. It was very nice evening with nice mild light. That's all for today, pour yourself a wee dram (I'm enjoying the PX Cask this evening) and have a great weekend!